Wnt signaling is an evolutionarily conserved regulatory pathway that governs numerous normal cellular and developmental processes such as cell fate determination, cell proliferation, and migration. However, aberrant Wnt signaling has also been identified as a key mechanism in cancer biology. 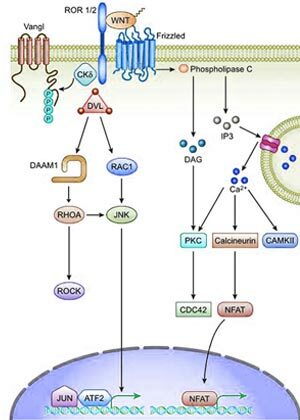 This article summarizes both the canonical (β-catenin dependent) and non-canonical (β-catenin independent) signaling pathways. It also highlights the role of Wnt signaling in numerous cancers and discusses novel approaches to targeting the pathway. Canonical Wnt signaling is activated as secreted Wnt ligands bind to the seven-pass transmembrane receptor Frizzled (Fzd) (dark blue) and the single-pass low-density lipoprotein receptor-related protein (LRP) (light blue). LRP is then phosphorylated, which leads to the recruitment and polymerization of Dishevelled (Dvl) proteins (red) at the plasma membrane. The Dvl polymer (active) is now able to inactivate the destruction complex; that consists of AXIN, adenomatous polyposis coli (APC), and GSK3β, which leads to the stabilization and cytoplasmic accumulation of β-catenin (orange) which then translocates to the nucleus. Wnt ligands bind to the ROR-Fzd complex (dark blue) which leads to the recruitment and activation of the Dvl protein (red). In its active form Dvl, via de-inhibition of DAAM1, is capable of binding to Rho (a small GTPase) (brown). Together, Rac (dark blue) and Rho trigger Rho kinase (ROCK) and JNK. This ‘trigger’ changes transcriptional responses and can also lead to cytoskeletal rearrangements. Aberrant Wnt signaling is linked to several different types of cancer. 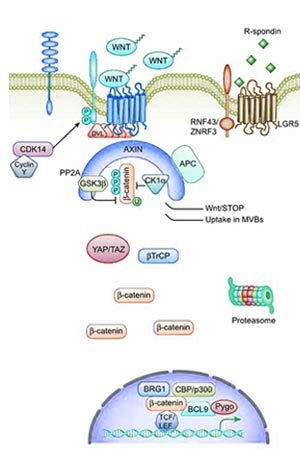 The Role of Wnt Signaling in Cancer. Many existing cancer drugs designed to block Wnt signaling are ‘non-specific’ meaning they target both normal cells and tumor cells which can result in significant adverse effects. 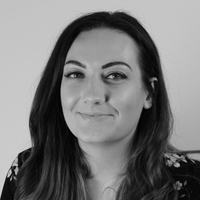 A major challenge resides in developing a strategy effective enough to target the dysregulated Wnt pathway whilst limiting/ preventing damage to the normal functioning of the Wnt pathway, ensuring that its essential role in numerous critical cellular processes remains unaffected. Why is it so challenging to target the Wnt signaling pathway? There are a number of Wnt-signaling pathway inhibitors currently being investigated for numerous cancers, including colorectal, pancreatic, breast, lung and leukemia. This type of inhibitor prevents the membrane-bound O-acyltransferase (MBOAT) known as Porcupine (PORCN) from supplying the palmitoyl group to Wnt proteins, addition of this group is crucial for the normal secretion of the Wnt protein. Examples of inhibitors currently in development include LGK974 (PORCN-selective inhibitor) which has been shown to prevent tumor growth in vivo. Ongoing clinical trials are investigating the use of LGK974 for head and neck cancers, and colorectal cancer. The small molecule PORCN inhibitor ETC-159 has been shown to be efficacious in preclinical models of RSPO-translocated colorectal cancer.10 Phase 1 clinical trials are currently ongoing.